Everything you wanted to know about the Honda Civic but were afraid to ask. The 2.0-liter, dual-overhead camshaft K20Z3 engine in the Civic Si Sedan produces 197 horsepower at 7800 rpm and 139 lb.-ft. of torque at 6100 rpm. 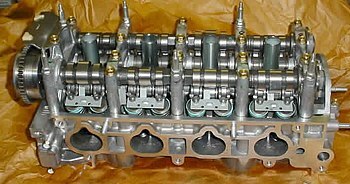 Thanks to special Honda-developed performance technologies, such as the ultra-precise Drive-by-Wire™ throttle system, 3-rocker i-VTEC® variable valve timing, a cold-air intake and equal-length exhaust header, the K20Z3 engine boasts an impressive flat torque curve from idle, all the way to its race car-like 8000-rpm redline. Plus, the K20Z3’s intake and exhaust system is quiet and unobtrusive when cruising at highway speed, but produces an aggressive, sporty sound at full throttle. 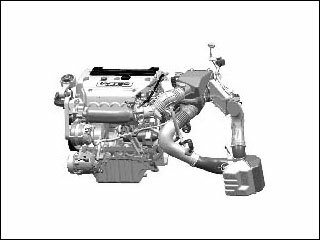 The K20Z3 is a 2 litre, inline-4 cylinder with both an aluminum block and cylinder head. It was produced in the US in the 2006 and on Honda Civic Si and in Canada in the Acura CSX Type-S.